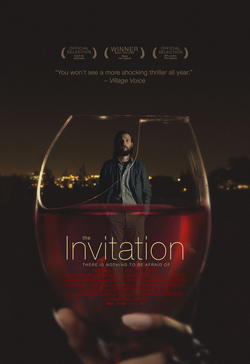 Tag line: "There's a plan for us"
In the pre-title sequence of director Karyn Kusama’s 2015 horror film The Invitation, Will (Logan Marshall-Green) and his girlfriend Kira (Emayatzy Corinealdi) are on their way to a dinner party when they accidentally hit a coyote, which darted in front of their car. Though badly injured, the coyote is not dead, so Will decides to put the poor thing out of it misery by hitting it on the head with a tire iron. By the very manner in which its presented, we know this accident is no random event: whether directly or simply thematically, this scene will prove important later on, and like everything else that occurs during this extraordinarily engaging movie, it will take some time for us to realize its significance. The dinner party is being hosted by Will’s ex-wife Eden (Tammy Blanchard) and her new husband David (Michiel Huisman). It has been two years since Will last saw Eden or visited the house they once shared, and when he and Kira finally arrive, Will is surprised to learn that six old friends have also been invited: Miguel (Jordi Vilasuso), Tommy (Mike Doyle), Ben (Jar Larson), Choi (Karl Yune), Gina (Michelle Krusiec) and Claire (Marieh Delfino). Though glad to be reunited with his former pals, Will can’t shake the feeling that there’s something unusual about this party, a hunch that only gets stronger when Sadie (Lindsay Burdge), and Pruitt (John Carroll Lynch), who he had never met before, also turn up. Thanks in large part to the fine performances delivered by its cast, every character in The Invitation feels 100% genuine, and we enjoy the time we spend with them. Yet it’s the meticulous manner in which director Kusama peels away the layers of this emotionally-charged story that truly impressed me. With each passing scene, we learn a little more about these characters, including the heartbreaking event that tore Will and Eden apart, and what it was that caused Eden to go searching for a way to end her pain. To reveal more would be unforgivable; The Invitation is such an expertly crafted mystery that it earns our patience, and I was perfectly happy to let it play out at its own pace. Even in those scenes that are dialogue heavy, every moment in The Invitation feels important. It is not often you can say that about a horror movie (or, indeed, any film). But then, The Invitation isn’t your average fright fest, and when all of its mysteries have been revealed, you’ll be damn glad you sat through it.